in the shade of the trans-Himalayan ranges! The breeze on your air, an off-beat trail, and the sense of adventure that comes with being on your own. Yes! That?s the thrill of mountain biking in Nepal. With challenging mountain roads that climb up to spectacular views, and adrenaline pumping descents, with quaint villages off the main roads, Nepal is virtually a paradise waiting to be discovered on your mountain bike. Nepal is the world's number one adventure playground for mountain bikers. From the flatlands of the Terai to the terraced hillside farms, the vertical landscape soars towards the snow clad peaks of the Himalayas, inviting you to share the adventure of this awesome landscape. The tropical lush vegetation is a rich contrast against the stark, arctic regions where winds have swept, sculpting amazing forms on arid valleys of the Tibetan plateau. 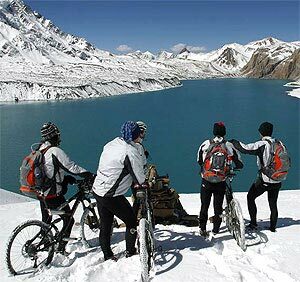 Mountain biking is a tremendous way to see the exotic sights of the Nepal kingdom such as the ancient routes of Trans-Himalayan Traders and the rural village life of Nepal. Discover yourself in one of the world's greatest wonders by joining us on an exhilarating and memorable biking adventure in the Himalayas. Our custom designed program takes you to explore the country with the fun and adventure. Each route is carefully designed to recognize and encourage the varying skills and interests of the riders as well as to feel the real adventure. A bilingual skilled cycle-guide would always be there with you for the support on the trips and if required a four wheel jeep is also arranged along with wherever possible! Let your thrill rise with us!